Proven to help you sleep, relax, renew - anywhere! Sound Oasis Travel sleep machine is a unique sound therapy product that combines high performance digital sounds with a full-featured travel/alarm clock. 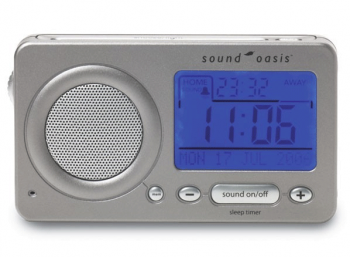 Incorporating 18 digitally recorded sounds, an exclusive jet-lag reduction sound and a voice memo feature, Sound Oasis Travel S-850 sound machine allows users to drift off to sleep with soothing nature sounds and wake up to one of four alarm sound types (sound, jet lag reduction sound, voice memo or buzzer). Powered by 4 “AA” batteries or the included worldwide AC adapter, Sound Oasis Travel is ideal for use while traveling or at home. Its compact size allows the unit to comfortably slip into briefcases, carry-on luggage and even one’s jacket pocket. Sound Oasis Travel S-850 noise machine incorporates a multi-position timer (with 4 selections: continuous, 30, 60, and 90 minutes), a unique “gradual off” volume reduction feature for a peaceful decrease in sound volume, a rotary on/off volume control, headphone jack and a one-touch off/resume button that stops the unit or repeats your last played sequence.